Stay competitive by reducing operational costs. Solar power can be generated at as low as 6/= per kWh compared to 15-21/= from KPLC and 40-50/= per kWh from generators. 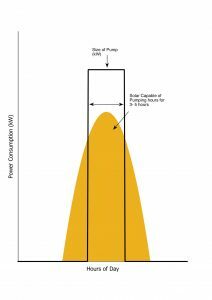 Whether you are on or off grid, reduce your pumping bills by up to 95%. Secure your cost of power generation for the next 25 years, protect yourself against extremely high Kenya power rates, the expected increases and inflation. 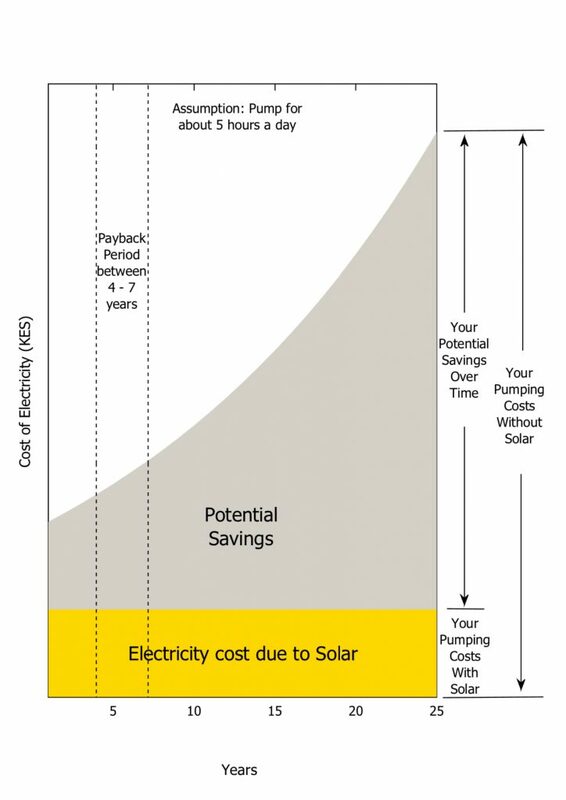 Enjoy a reduction in your operating costs and improve your cash flows as soon as you go solar! We ensure the most efficient system design for your pumping requirements. We ascertain whether you require a grid-tied system, VFD system or hybrid system in order to provide you with reliable pumping. See your own power consumption and system performance in real time, manage operations efficiently, and know how much solar is saving you. We monitor the system 24/7, providing customer service and maintenence support throughout the system life. Solar is a long term investment, it has a very attractive NPV and IRR, hence making it a smart investment for your future. Enjoy a ROI of between 20%-40%. Operate in a environmentally conscious way – reduce your carbon footprint, benefit from marketing your company and products as ‘manufactured with ‘the power of the sun’. 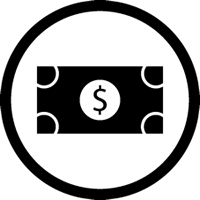 Tailored financing options will be structured for your requirements if applicable. Detailed reporting will be outline financial implications. Gain full independence of your pumping and power requirements on the farm, protecting you from future increases in electricity rates and diesel costs. Our best in-class engineering means that the independence created by the solar system is there to stay, for many years to come. We analyse – Your roof structure, your equipment/property setup, electrical configuration and any upgrades required. We provide – System design – Aim to reduce LCOE (Levelised Cost Of Electricity). Customized proposal with various financing options – This service is free from Illumina Africa. Will I get the same amount of water? Yes, when the pump is running at full capacity the water yield will be as always. The solar system is sized to produce enough energy to power and run the pump at full capacity based on the specific ratings of the pump. The pump will not run at full capacity very early in the morning and on days of heavy rainfall. Do I need batteries to run my borehole pump? 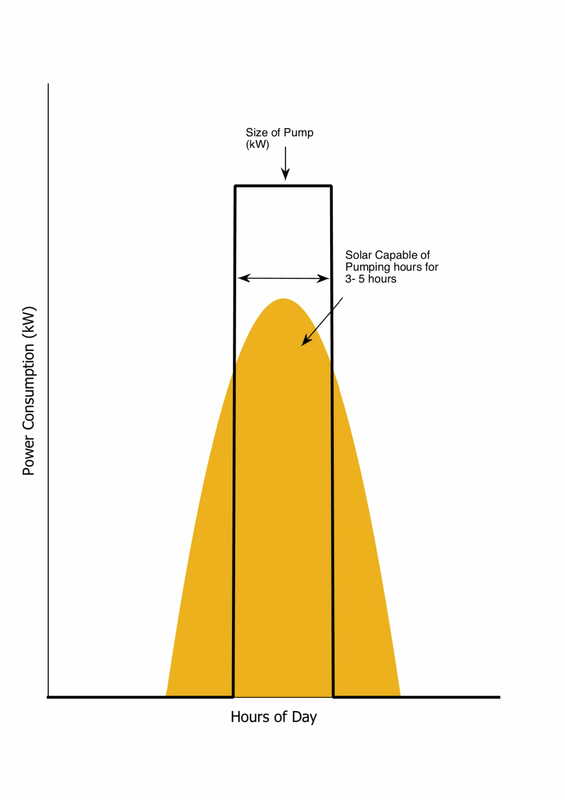 No, the pump can be run on solar directly during the day, and on the grid at night. Battery systems can be installed if the water requirements make it economically viable to do so. 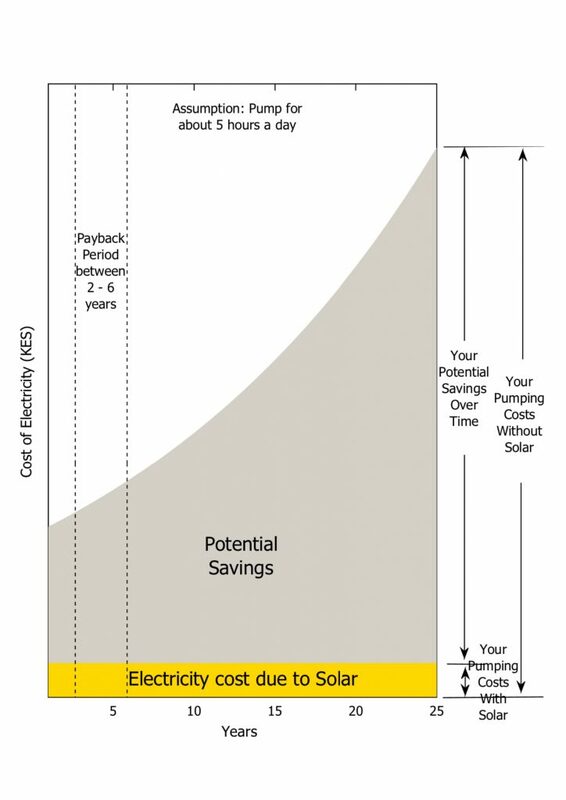 I cannot afford to buy the solar system, can I get financed? Financing through micro financing institutions, as well as Equity bank is available for clients with a credit history. The institutions will do their due diligence and structure a loan for you. 1 year after going solar at my home, I am happy to say I have reduced my electricty bill by 85%! and I have never used the generator since that day! Off-grid living is enjoyable, running all your requirements with solar power is amazing! Thanks to Illumina Africa for making sure the system performs as promised! Since the day I switched to solar, I have pumped water everyday and not paid a single shilling for KPLC or diesel to run my borehole pump! The solar works all day giving my farm continuous water supply for the crops, and excess water that we provide to the nearby communities. Effecient and clean installation procedure from Illumina Africa, they make it easy to help you understand what system is required for your particular applications. Thank you for making my switch to solar water so easy! their dedicated team makes sure every problem is identified before starting the work. My experience so far has been very informative and enjoyable. The team focused on helping me understand the various system and financing options, as well as how I operate my plant now and what I plan in the future - this made it very clear for me and allowed me totally sure with going solar with them! I am looking forward to running my house on solar with Illumina Africa! they give me great confidence! Kenya, as per our conservative calculations would need just 120 square kilometers of solar panels and 0.53 square kilometers of energy storage, in order to full power the country (as per current generation and demand requirements). This is equivalent to less than 0.2% of the area of Turkana which is 68,680 square kilometers. The sunlight we receive for just an hour is enough to generate energy for one year for the whole world. Unlike other energy sources, such as coal and oil whose reserves will diminish, the sun is here to stay and so is the energy we can gain from it.